Rare is it to open a science book whose first page tells you it will be an absolute joy to read. Usually it takes several pages or even chapters to get that feeling. 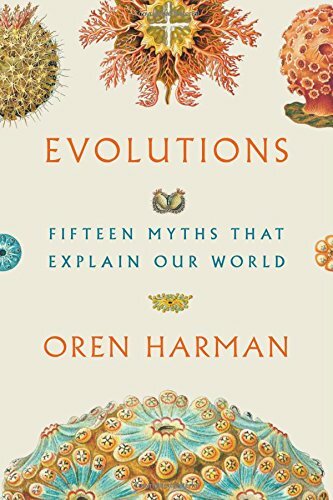 Not so with Oren Harman’s Evolutions: Fifteen Myths That Explain Our World, which is the most literary history of the universe you’ll come across. That is, though it is a book about scientific facts and theories, it is also a work of art. The discoveries presented in Evolutions are mind-blowing in themselves, but it is Harman’s skill in blending contemporary science and traditional storytelling that makes this book truly brilliant. By using such mythical language to retell the story of modern science, Harman transforms what we have believed into what we know. And, in doing so, he is slyly suggesting that what we think we know are still just beliefs—beliefs likely to be proven false or incomplete with the progression of scientific discovery. As Samuel Butler wrote, “Science, after all, is only an expression of our ignorance of our own ignorance.” After all, we put a man on the moon before we even knew where the moon came from. But Harman’s purpose is not at all to say that science is bunk, theories to be dismissed as myth. Rather, he’s arguing for the re-enchantment of the world through the reclamation of mythology. To him, myth is an expression of the awe of man looking into the heavens and asking why. They are reflections on our befuddlement. “In the age of the great beasts of the seas it was grow big or get armor or die swiftly, a grim predicament. Escaping the ruthless placoderms, the ancestor of all children and explorers decided therefore to take another route. As if planning its getaway, its morphing continued. Slowly the rib cage expanded, to make room for lungs that had once been its swim bladder. Nostrils drilled cavities down to its mouth as it lifted its head above water and drew first breaths. Its limb buds were graduating, incredibly, into fingers. And when no one was looking, the fish rested its weight on its wrists and prepared itself. Harman’s book does not deal specifically with religion, but with its use of various literary styles, it reads like a scripture, in the very construction of how it is written. For instance, many scriptures, such as the Hebrew Bible and the Lotus Sutra, are anthologies of texts mixing verse and prose, including first and third person narrative, and what can best be called literary fiction. Harman shifts between all of these genres in Evolutions, thereby—and perhaps unintentionally—creating a scripture of science. His focus might be on myth, but what the final form his book fulfills is a text presenting science as religion. In fact, if a future or alien civilization came across Evolutions, they might indeed consider it to be a work of scripture. He similarly humanizes the whale and the octopus, narrating the story of their coming into being in the first person. The personification usually works, but sometimes the language swerves too far into the lyrical, obscuring the meaning by forcing meter and rhyme, creating difficulty in following the story—or perhaps the lyrical doesn’t lend itself to explaining the evolution of the eye, or how Methanogen, in its eon-long tussle with Oxygen and Alpha, produced Typhus. The idea of evolution as error could be the main theme of this history. Because overall, the story of how the universe, the solar system, multi-cellular life, humans and everything else developed is unsentimental, undirected, indifferent, arbitrary, nothing personal. It’s beyond mind-blowing, but it’s more than a bit demoralizing. Love, for instance, when life began “was not a search for happiness,” Harman writes, “but a strategy for survival.” That is to say, romance—the crowning fruit of the tree of humanity, celebrated in our greatest works of art, and commodified by countless advertising companies and dating sites—is nothing more than a trick of evolution, a fluke of mutation that fools us into thinking that we’re special and life is beautiful. And despite our current (or 3,000-year-old) trend of meaning-making, this 13.799 billion-year history makes it clear that all of this—the multiverse and everything that ever happened—ultimately means nothing. We love, hate, worry, get jealous, fight, become bored, anxious, smile, feel happiness, study, scroll, swipe, pray, practice yoga, paint, write books (and book reviews), spend hours in an office, eat, drink, and mate all for the same reason that a star comes together, shines, and burns out—that is, for no reason at all. And to really put things in perspective we can just think that “the 300 sextillion known stars and 100 billion known galaxies are but a fraction of the Universe,” and that, according to String Theory, there are at least 10500 other universes. For centuries, science has disrobed the mythic world of its wonder. But with such breathtaking modern discoveries, the world is being recast in terms too grand for our brains to comprehend. And so to fathom “truths beyond our jurisdiction,” Harman is saying let’s not forget science, but let’s also turn back to myth, reframing our scientific narrative within the history of the stories we tell ourselves about what we’re still trying to understand.